rain pelted the cockpit windows. The pilots were tracking the localizer course to the airport after being cleared by Air traffic Control (ATC). Passing 4,000 feet the captain contacted Juneau Tower and reported over Barlow Intersection, only ten miles from the runway. The landing gear was lowered and both pilots watched the flight instruments, stealing an occasional glance outside for a break in the weather. In a matter of minutes they would be safely on the ground. The aircraft never arrived. Fourteen minutes after the flight’s last transmission, the control tower notified search and rescue facilities of a possible mishap. Wreckage was spotted several hours later in the Chilkat Mountain Range, eighteen and a half miles west of the Juneau airport. Debris lay scattered in a wide area on a snow covered slope. Fire had blackened some of the wreckage, but major portions were untouched along the edge of a ridge and adjoining canyon. The point of impact was 2,500 feet above sea level, in approximate alignment with the localizer course. There were no survivors. At the time, the accident was the worst air disaster in U.S. history, taking the lives of 104 passengers and seven crewmembers. 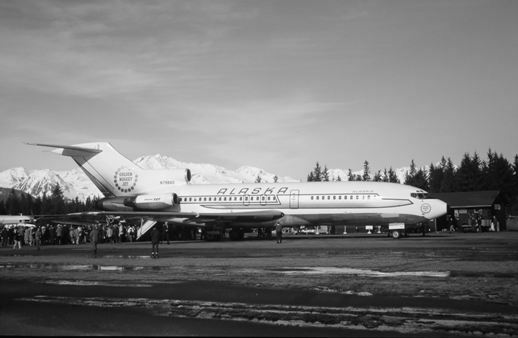 There was no precision landing system at the Juneau Airport in 1971. A precision approach would have allowed the plane to descend along a set track by providing lateral and vertical course information through a localizer and glide slope. Only two non-precision approaches were available, both utilizing a localizer for lateral information and separate navigation beacons for fixing points along the inbound course. The mountains around Juneau also required an approaching aircraft to make a final turn to the runway three miles from the airport. 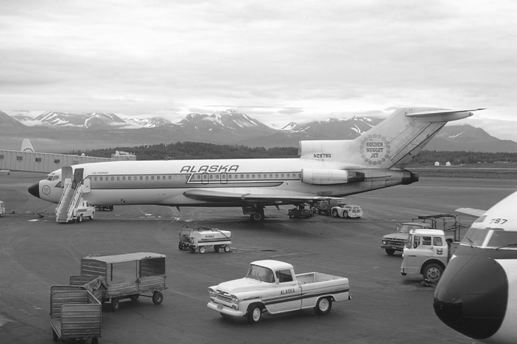 Alaska Airlines flight 1866 (AS66) was a daily scheduled passenger flight from Anchorage to Seattle, with intermediate stops at Cordova, Yakutat, Juneau and Sitka. The flight was operating under instrument flight rules (IFR) as required by federal regulations. Captain Richard Adams and First Officer Leonard Beach were in the pilot seats, with Second Officer James Carson in the flight engineer station. Cabin attendants Patti Kessner, Deborah Berg, Patricia Hilla and Cathy Beach were in the passenger cabin. Yakutat was 11:07. While on the ground a clearance was issued by air traffic control for the next leg to Juneau. Departure was at 11:35. Approximately thirty-five minutes into the flight, the Boeing727 impacted the western side of a barren hillside in the coastal mountains. climb and maintain flight level 230 (23,000 feet). Pleasant Intersection at 10,000 feet. AS66 reported leaving FL230 at 11:51. Three minutes later the controller instructed the flight to maintain 12,000 feet over concern about another aircraft, and changed the clearance limit back to Pleasant Intersection. A Piper Apache out of Juneau was not following instructions and its exact position couldn’t be confirmed. Radio contact between the Piper and ATC was hindered by a weak radio aboard the private plane. AS66 reported over Pleasant Intersection at 11:58. Coordination between the cockpit crew seemed to be distracted by the ongoing situation between ATC and the Piper Apache. Captain Adams voiced obvious concern about the other aircraft to the first officer and spent several minutes acting as a radio relay between the smaller aircraft and ATC. First Officer Beach was on the controls. Upon arrival over Pleasant, the controller cleared the flight to Howard Intersection at 12,000 feet and to hold west of the localizer. 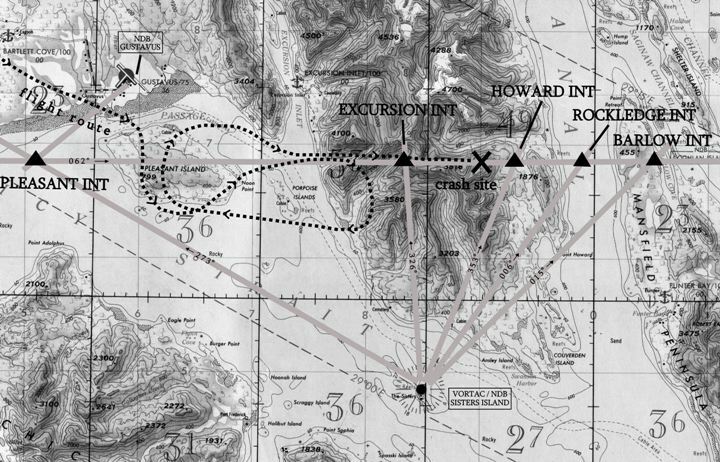 At 12:01, only a minute after receiving the clearance, Captain Adams reported the flight’s arrival over Howard, even though their actual location was nine miles west. The distance between the intersections was twenty-one and a half miles, requiring approximately five minutes of flight time. None of the crew noticed the time discrepancy. Concern over the Piper’s location continued to distract their attention. stated they were on the inbound track to the intersection, the controller cleared the flight for the straight in Localizer Runway 8 approach to Juneau and to cross Howard Intersection at or below 9,000 feet. Captain Adams acknowledged and reported the flight leaving 12,000.
light rain showers and winds out of the southeast at thirteen knots. reflected an uncertainty with their location for the first time. AS66's flight route along the inbound course to Juneau.